Olshan partner Steven R. Gursky delivered a speech during the dedication of the Dr. Martin Luther King, Jr. National Memorial commemorating the life and work of Dr. King. 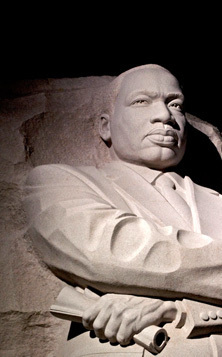 The 30-foot-tall granite sculpture of King is located along the Tidal Basin in between the monuments honoring Presidents Abraham Lincoln and Thomas Jefferson. Steve, who heads the firm's Intellectual Property Department, is a member of the Board of Directors of the Martin Luther King, Jr. National Memorial Project Foundation, Inc. which raised almost $120 million of private funds to erect the memorial. Steve provided extensive pro bono legal work to the Foundation. To view Steve's speech please click here.